Welcome to the Bread course of the Virtual Vegan Potluck! This is just the beginning of some tasty carbs – both savory and sweet – here at the Potluck. Thank you so much for being part of our delicious plant-based event. I know you’ve already enjoyed lots of goodies – and there are a lot more to come! Hope you left some room on your plate for a roll or two! No doubt about it, I’m a bread junkie. I love kneading, baking and especially eating it. 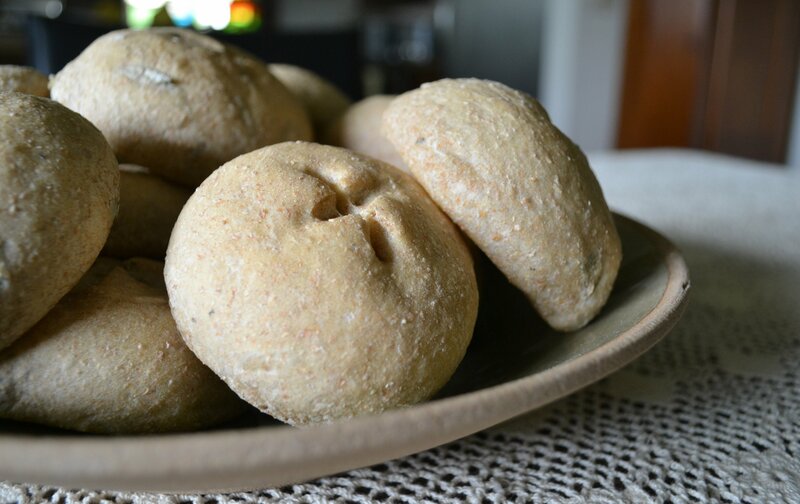 And I love these Sage & Rosemary Dinner Rolls. Simple, elegant, easy to make and packed with summery, warm, herb flavor. (If I’d included parsley and thyme I could’ve called these Simon & Garfunkel rolls…) Inside they’re soft and fragrant; on the outside they have a satisfying and tender crust. They smell so wonderful fresh out of the oven. Serve these flavorful, healthy rolls alongside some not-so-healthy but mouthwatering Roasted Garlic Coconut Butter, the recipe for which you’ll find below. It’s also easy to make and full of flavor; the perfect complement to the rolls. Soft, fragrant dinner rolls with sage and rosemary that are paired with luscious roasted garlic coconut butter. In a large bowl, whisk together the water, yeast and agave nectar. Set aside for about 5 minutes. Meanwhile, in a smaller bowl, combine the bread flour, whole wheat flour, sage, rosemary, salt and pepper. When the yeast mixture is bubbly, add the flour mixture and stir until a wet dough forms. Add small amounts of flour – just until the dough doesn’t stick too much to your hands. Either knead in the bowl or on the counter for about 8 minutes. The dough will be very soft and should be smooth. Place dough in a lightly oiled bowl, cover with plastic wrap and let rise for about 1 hour. Line a baking sheet with parchment paper. Preheat the oven to 350-degrees F. Bake the rolls for about 20-25 minutes, or until lightly brown on top and firm on the bottom. Cool rolls on a wire rack or serve warm alongside Roasted Garlic Coconut Butter. Make your own creamy, spreadable vegan butter! Combine soy milk, apple cider vinegar and salt in a small bowl and set aside for 10 minutes. Gently melt the coconut oil. In the bowl of a food processor, combine the mashed garlic, soy milk mixture, coconut oil, canola oil, soy lecithin granules and xanthan gum and process for 1 minutes. Scrape down the sides of the bowl and make sure no lecithin granules are sticking to the bottom. Process for an additional minute. Pour mixture into silicon molds or ice trays and freeze for at least 1 hour before removing from trays and using. Thank you so much for being a part of the Virtual Vegan Potluck! We’ve all had a lot of fun planning and putting this event together and sharing it with you has been the best part. I know you will find many delicious vegan recipes to add to your repertoire. To read about the origins of the Virtual Vegan Potluck, please visit this post. I wish I didn’t love bread so much! Glad you were along for the ride – and yes – definitely a next one! So many of my favourite things right here in this post… fresh rosemary, sage, roasted garlic, fresh BREAD! Amazing, and thank YOU so so MUCH for all the hard work you must have put in to co ordinate this event. You’re a Star! And thank you again for organizing! This is so fun! Youare a rock star! Thank you for this recipe & for the potluck!!! So glad you stopped by to share a bite to eat ;-)! These herbs are perfect. This bread looks fluffy, and you are a wonder woman in the kitchen!! You are so awesome for putting all of this together..I want to be your best friend. Breaking bread with all of you wonderful bloggers – makes my day! Thanks, Brittany! Glad to have you playing along! Simply the best flavor combos Annie! Your recipes are always inspiring and you have brought to much, more than just bread, to this virtual community. Brava Girl! Your dinner rolls look so good! Great job with the potluck, what a great event. So many amazing recipes, where to begin. Well, I guess I’ll start with one at a time from the beginning! Thank-you so much. Thanks, Dena! I’m feeling overwhelmed – in a great way! Thank you for suggesting and organizing VVP. I am LOVING this! It’s crazy, isn’t it?? I’m loving it, too – but oh my – the recipes! The recipes! That cocoa butter hasme fascinated! Everything looks delicious! Thanks! I have to hold myself back on the coconut butter…it is so good. ANNIE! I am so amazed going through everyone’s posts– and it’s all thanks to you! Incredible job! And these rolls look awesome… anything with roasted garlic and I’m in! Great job with the rolls and butter! I messed my post up after all. I set it to auto- post this morning at 6AM, but it never posted. Checked it at 10 and I was totally let down. Just fixed it. Sorry- didn’t mean to break the chain. Not sure why it didn’t work. Listen, I’ve had my share of posting issues…Don’t worry about it. We still have some folks who are not “on line” yet. Looking forward to getting to your post ;-)! I definitely need to get some of those weirdo ingredients so I can start making my own coconut butter. Every time you post about it, I start drooling. Don’t deprive yourself of weirdo ingredients! They make great stuff :-)! I love your bread recipe posts. They always look so yummy and make me want to bake 🙂 Thanks so much for organizing the Virtual Vegan Potluck! I’ve been browsing recipes all morning, and everything looks great. Thanks for bringing everyone together! I’m so glad it worked out! I’m into the desserts now…I want to make them all! Ooh, haven’t gotten there yet, but I bet that section is going to make me hungry! This all looks great! Thanks for organizing this! You’ve done a marvelous job! Thank you! I’m loving all the new recipes!! Oh yum! I am such a carb junkie and your bread rolls are making me salivate! They look so light and fluffy! Fabulous! Love these and I think we share the same taste in herbs 🙂 Loving that butter, going to give that a go for sure!! xo! If this were a live event, I would leave with my pockets FULL of these. Then I would dump them in the car, pretend I forgot something in the kitchen, and fill my pockets again. Very well done- I hope ours look as light! That’s the sign of a good potluck! Thanks, Jason! Will definitely be looking for your help on the next one! The roasted garlic picture – omg… looks soo good! Wow these look and sound amazing! Can’t wait to try them. Thank you for organizing this fun potluck!! I love you and your bread! Awww, Barb! Hugs, girl! PS – please check your comments – I left one, but now don’t see it. Your cookies look fab-u-lous! Weird, didn’t show, but thank you!!!! Grrr! Left another comment, but again, I don’t see it. Sigh. Know that I love the cookies! Bah! They spammed you! What in the what?! I fixed it. 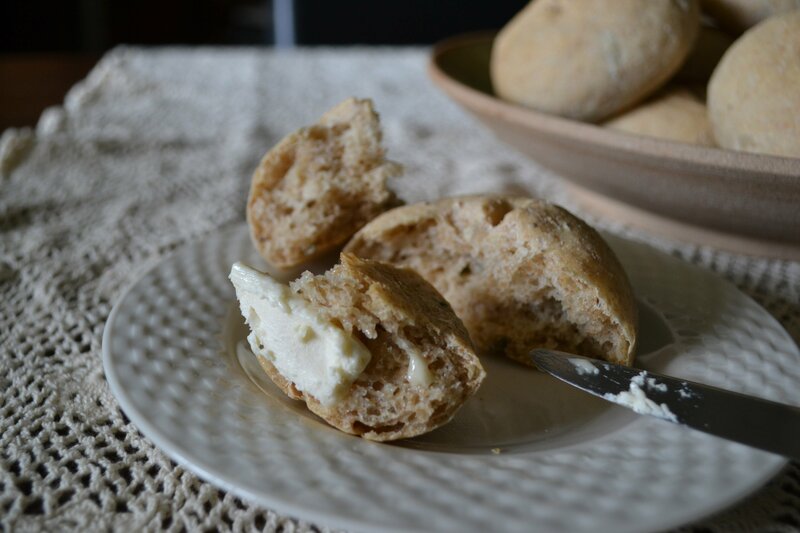 Dinner rolls with fresh herbs AND garlic coconut butter – okay, can it get much better than that? Looks awesome!!! I must learn how to make the vegan delicious butters you make – I will come back and study 🙂 Thank you – the potluck is incredible!! I’ll be posting a VVP update probably Monday or Tuesday – be sure to check it out! Would love to have you on board! Nice! (You should open a bakery, I would shop there every day!!!) Thank you for the potluck idea, it seriously is the best blog event ever! Yeehaw!! It’s been crazy fun. And…it’s only the beginning…?? Absolutely! Don’t want that blood sugar to drop! Hehe – have a fabulous time! Whew! Ann! I’m such a disaster! I’m so sorry to have put up my own post so late! (laptop is in a better place now, sadly) These rolls are fantastic! Hey, Char! Glad you are enjoying the Potluck! And thanks – it’s been so fun! Haha, sorry, girl! You’re just going to have to make some! These look so delicious! I’ve been on a total bread kick lately, and your rolls have just made my “to bake” list… Love roasted garlic! Yum! Thanks, Starr! This is a really good, easy recipe that yields delicious results! Thank you, sweetie! I’m sorry to make you miss bread! Oh I lurrrrve sage and can only imagine how delicious these are with the coconut garlic butter!! Sage is wonderful, isn’t it? So earthy. And yes, with the roasted garlic…good stuff. First of all, thank you for your hard work on this event. I’m still making my way around! I am a sucker for bread and butter so I can’t wait to try this! You and me both! What would I do without bread?! Thanks for joining in! Entering the bread course, I’m excited! Your recipe looks soo divine! Open up an eatery already! But do it here in SF hehe..I’d love to try your recipe in the mean time, starting with the butter, yummy…btw, thanks for organizing the potluck! Im all pumped up to create a storm in the kitchen. Yay! Thanks, Richgail! We are all feeling very culinary-ily inspired! this is so cool! id love to be a part of the next VVP 🙂 these recipes are all looking stellar. We’d love to add you to the list, Elise! I’ll be posting a post-game tomorrow ;-)! Oh, nothing to it!! You can make these rolls and you’ll be all proud and happy AND then you can devour them with the garlic butter…Thanks, sweetheart! My turn to write, “I learned so much!” I love butter . . . and I love coconut oil, sugar, milk . . . now it time to bring the two together in a perfect marriage of deliciousness! I can’t wait to try this recipe out . . . how I miss butter! Much love, Annie. You’re a star, as they say in England. What a wonderful treat to have met you– and to have participated in your spectacular event! Jen! Thank you for the kind words!! I think the next VVP go-round will be even more fun and amazing! Your photos are absolutely amazing 🙂 Can’t wait to try this recipe.